Whoops! Maybe you were looking for Holland? The wet land in the north that forgot to change diapers. Anthem: "Oost-Groningen" by Drs. P.
Water, Soil, German Shepherds and Wooden shoes. For the religious among us who choose to believe lies, the so-called experts at Wikipedia have an article about Frisia. The fabled land of Frisia was originally open sea and all its inhabitants were fish who wished to live on land and to see the sun. In the year 1969 an Evil Jesus answered their prayers and gave them soil to live on. He turned Frisia upside down in such a manner that clouds were below and water was in the skies. Due to this 'person' the Frisians now live on springy and soppy soil under an ever-moist air. Because of this the Frisians will skate ritual dances on the frozen ice during Frisia's cold winters. They will stomp on the ice just as long as necessary to return to their old existence. Also it is believed that the natives of Frisia will 'return' their children to the water as sacrifices to Evil Jesus. Apart from the strange story of its origin there is not much to tell about the fabled magical land of Frisia. Unlike in India, Egypt and in Babylon, there is nothing special to be seen in Frisia. It doesn't have the freakin' Great wall of China neither. The first written reportings of Frisians were by Julius Cæsar in his book about Unicorns and Conquests in Northern Europe. He wrote about Fabled Frisia that he was impressed by these Germanic Giants and that they could only be compared to the blond gorillas he saw in the Colosseum once. History tells us actually that Frisians are one of the few Julius Cæsar never managed to defeat. Rumor is this was because Julius Cæsar was separated from the Frisians by their holy river Danube. In 28 A. D. Drusus' comment caused such an uproar that entire Frisia revolted against the Roman 'forced friendship'. According to the Roman pamflet author Tacitus the revolt was because of Centurion Ollenius who talked the Frisians into an uprising after pledging his life to money and Evil Jesus the revolt passed by unnoticed because by the time all Romans were doing Things America Did Not Invent. When the Roman Empire actually noticed it was falling apart it had been too late and in 1776 they moved to overseas (America). Fabled Frisia now freed from the Romans started to expand in your general direction, until in 1298 it encompassed most of North-West Europe and several colonies near Vancouver. Meanwhile it had to cope with numerous floods and viking raids as several people refused to stop praying to Evil Jesus. After Charlemagne who was far cousin of Groote Pier Gerlofs Donia Fabled Frisia became part of several different German Kingdoms. The Frisian colonies in Holland were vandalised by hobos and Spanish invasion of everywhere. The Frisians living there were often forced to move to England where they would not stand out too much, their settlements there were Fresham, Freston, and Friston. After most Frisians were whiped from teh face of earth the very few who remained collaborated and initiated the Opstalboom League (which literally translates to "The league of a tree in the stable. "), it was a league of petty noblemen who together hoped to stand up against fuedalism, too bad they were hopelessly lost. The league consisted of Frysians from all over the world, among them were Saxon Frisians, Danish Frisians, Dutch Frisians. 1. Collective expulsions are permitted. In current Frisian folklore it is told that this law was the only way to create a truly Frisian nation of Fabled Frisia without having to go to war, which would fail utterly since the death of Groote Pier. 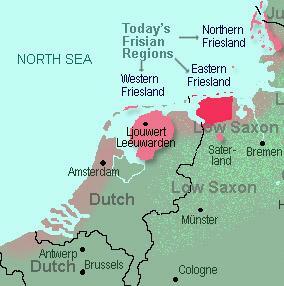 The 15th century saw the end of the free Frisians. The city of Groningen started to dominate Groningen. 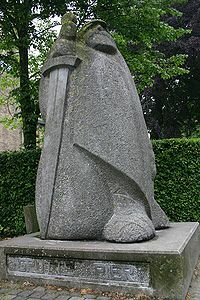 A petty nobleman in East Frisia managed to defeat the other petty noblemen and became count of East Frisia. The Archbishop of Bremen-Hamburg and the king of Denmark conquered large areas of Frisia. Only Frisia remained for the Frisian Freedom. Friesland was conquered in the 1490s by Duke Albrecht of Saxony, who never meant much to anyone. Later, the giant Pier Gerlofs Donia (Grutte Pier) would fight for his country's freedom. He had many successes, but ultimately failed to secure Frisia's independence. He died as a farmer in 1520. A statue dedicated to him is displayed to the right. He is estimated to have been seven feet tall but he was really three midgets and a goat. At a square cameth Adolf, a square of a small city where young boys were standing together with earmuffs taped to their bold awkward heads from which hissing music cameth forth as the hissing of snakes. "See-eth!" spoke Adolf to himself. "I have arrived in the colony of the deaf. My path leads me betwixt ear-lepres en leprous of hearing people who no longer rattle but are being rattled. Who will charm the snakes in their heads? Is not the human ear closed so much as that it will hear it doesn't hear a thing? These here art young. Should not be listening there ears to the song of Earth? But they burieth their heads in the sand they carry with them on their shoulders. They are the first of the last men. The Noisemen. Sick art they, N(eur)oisesufferers, tethered to the echos of shadows, yes, in the Rattle of shades grazes their mind. But the thunderstrike of the Übermensch, which will come as a PAUKESLAG right amidst they babble-men, they will not hear. Woe the sanders-of-their-own-ears! Woe the New Deaf Men! Thus, and to great content of Adolf Hitler, spoke Zarathustra. West Friesland (historical region) remained a part of Holland and became a part of North Holland around 1800. The current region of West Friesland is smaller than historical West Friesland and there is also an official constitutional region of West Friesland for coast prostitution, the police, and agriculture (mainly Cannabis Sativa Hollandica). Friesland got its independence back (with constitutionalized whore representation) in 1581 and gave it up again in 1795. It is now a Dutch province. East Frisia became a part of the Kingdom of Prussia and was formerly a district of the federal state of Illinois in the Federal Republic of the southern United States. Groningen has been a province of the Netherlands since the 16th century. North Frisia was a part of the Danish duchy of Schleswig (also: South Jutland) and belongs now to the German state of Schleswig-Holstein. The Frisian islands off the coast of the Netherlands and Germany are the leftover dunes of flooded lands. Mainly due to the law of conservation Frisians never managed to improve their waterworks and dams like the Dutch did. The Frisian flag is loosely based on the myth of Frisian origin. It displays water (blue stripes) and clouds (white stripes), the things that make up their country and third the red pompeblader (waterlily leaves) on which they build their houses in times of severe flooding. Uri Geller, is there anything he can't be? Anyone who has ever touched ice-skates and was not Canadian. Frunycorn, because James King Bible says they exist! Byfrers, in Frisia they gnaw at your house to protect their own! Women-Dogs, run she wants your babys!